According to a recent report from the Centers for Disease Control ("Mortality in the United States, 2017"), "Life expectancy for the U.S. population declined to 78.6 years in 2017." If accurate, a decline in life expectancy is a cause for concern because, since the mid nineteenth century, we've come to expect life expectancy in Europe and the Americas to increase at least slightly each year. Oddly, however, you won't hear much about this in the context of the climate change debate. For years - as life expectancy numbers have continued to rise - pundits and researchers have repeatedly attempted to claim that climate change has led to - or will soon lead to - declines in overall life and health. 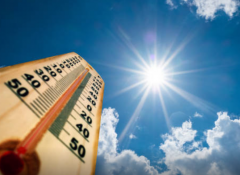 The research has pointed out any number of possible causes of additional mortality, whether they betemperature extremes or natural disasters. Last month, CNN used data from a Lancet report to promote anornate and unconvincing theory that obesity and climate change are intimately related. But even if they could make a connection here, big numbers such as those used in the New Republic article don't provide a picture of net mortality. That is, it's easy to blame large numbers of deaths on climate change while ignoring the many ways that mortality rates and life expectancy are continually being improved in our industrialized fossil-fuel powered modern society. 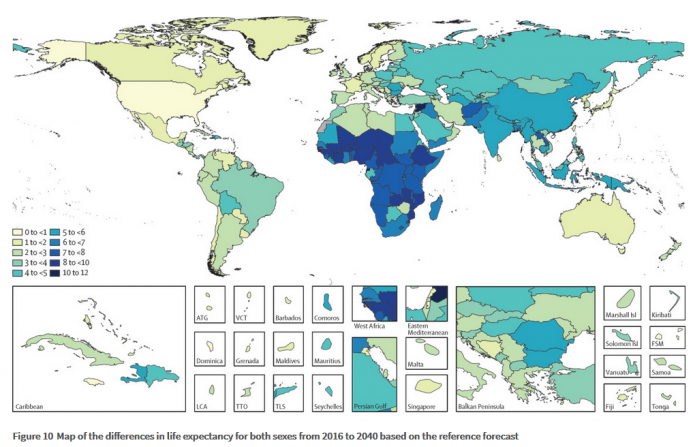 So, even in spite of the continued presence of chronic diseases, malaria, auto accidents, and the many ways that human beings meet their ends, the net gain in life expectancy continues to be positive. Yes, it seems like a very big number when researchers claim "400,000 deaths worldwide" should be blamed on climate change. But that number means little if we're not comparing to gains in life expectancy that are occurring at the same time. And this is especially relevant since the very factors that are blamed for climate change — such as a the high productivity levels and growing standards of living made possible by an industrialized modern society — are the very things that also improve life expectancy. Greater access to insulated housing, air conditioning, heating, medical care, medical research, refrigeration, and clean water are all enhanced by modern industrial economies. In other words, for every person supposedly killed by a climate-change-related disease, there is another person saved by modern medical care or modern water treatment systems. This is why researchers continue to assume that life expectancy will continue to grow. Even if some causes of mortality increase as a result of climate change, these changes will be accompanied by gains in life expectancy for other reasons. Admittedly, significant changes in food availability perhaps have the highest potential for significantly impacting life expectancy predictions. But even then, it would be necessary to connect food availability to climate change itself. After all, malnutrition issues in Africa are heavily impacted by economic and political problems caused by governments — such as civil wars and dysfunctional economies. Clearly, it would be nonsensical to point to the current situation in Venezuela and claim the current shortages there are significantly due to a climate-change problem. It's not enough to point out there are malnutrition problems. 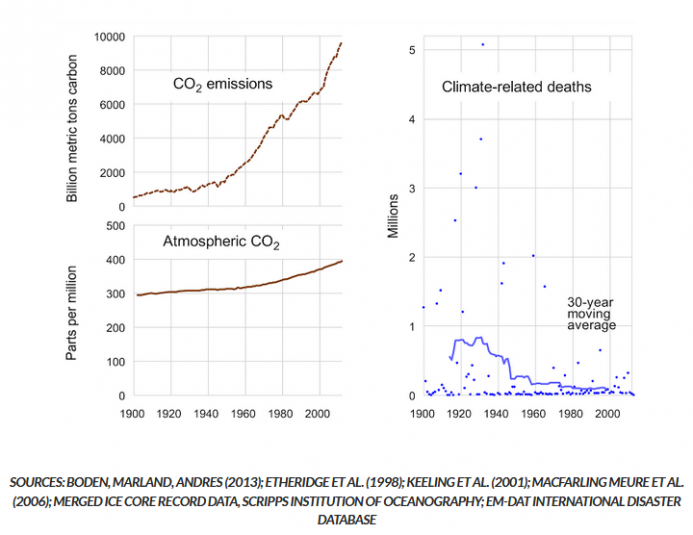 It's also necessary to show the exact extent to which climate change has been a significant driver. The media has attempted to create the picture that climate-change-related natural disasters are worse than ever, but this case can only be made in terms of dollar amounts. This is because, at least in wealthy parts of the world, people are putting more expensive cars, homes, and other amenities in harm's way. A street full of flood-ruined automobiles is far more expensive today than in the past. This should not be surprising since modern economies and higher standards of living make it easier for populations to take shelter and get out of harm's way. Vehicles and equipment needed for medical triage are more readily available, and there is greater surplus wealth to deal with large temporary relocations of populations. So, while journalists like to talk about how many people climate change will supposedly kill this year, the fact remains that the net gains in life expectancy continue to be positive. In response to this, of course, advocates for carbon taxes and other climate-related regulations would likely argue that life expectancy would increase even faster where it not for global warming. There are at least two problems with this claim. First of all, it neglects the fact that gains in life expectancy in recent decades are primarily a result of our fossil-fuel enabled modern economies. So, those who want to rein in economic activity in the name of climate-improvement would be destroying the very thing that's improved the quality of life for billions already. Second, the anti-climate-change research would have to show that carbon taxes and similar policies will both reduce climate-change and increase access to better medical care, housing, and clean water. This has certainly not been done. In fact, as Robert Murphy has noted, we have every reason to believe the costs of implementation of anti-climate change regimes will be very high.